Set after season two of Torchwood, Children of Earth once again reunites the team in a devastating battle to save our planet and this is probably one of the best stories from the entire mythology. Directed by Euros Lyn who is no stranger to Doctor Who, his talents have created an almost movie-like experience for the series with this current tale. This story revolves around 11 Scottish children who were given to an alien race called the "456" in the 1960's and now in the present, the repercussions are finally being felt. For the children of Earth, they are now being used as vessels to transmit the return of these "aliens" which causes shockwaves across the globe and those investigating the mystery are "mysteriously" silenced. With war brewing on Earth, Children of Earth is more of a political drama that works quite well with this genre (ala Battlestar Galactica), however the Torchwood Institute is more engaging than Battlestar could ever be. This my friends is where the team of Torchwood come into play and once again John Barrowman (Jack), Eve Myes (Gwen), Garth David-Lloyd (Ianto) and Kai Williams (Rhys) reprise their roles in this thoroughly entertaining mini-series. Although these are the core members of the team, Children of Earth also feature some strong performances by Nicholas Farrell as the Prime Minister and Katy Wix as Ianto's sister. Unlike other science fiction shows, Torchwood is quite realistic due to the political backdrop and social climate of the world plus each character has a story to tell, even as season two just finished. The story questions the viewer and what they would do if they ever faced a threat from the stars and no matter what choice they make, it will inevitably effect someone or something. Once again the BBC create an outstanding transfer to Blu-ray and the attention to detail is quite realistic and looks superb in high definition. Thankfully the special effects have taken a back step in this story which makes the story more believable. Matching the spectacular video quality is also high definition sounds that does make use of a surround sound system quite well, especially in certain episodes from this mini-series. When it comes to extras, it comes with a Behind the Scenes featurette and an audio clip by Eve Myles, nothing great but nonetheless, interesting. 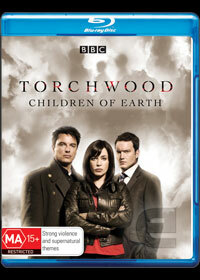 Definitely a must have Blu-ray for your Torchwood collection!